This will give the internet company a "relationship for life" with students - who can carry on using these e-mail addresses after graduating. Trinity College Dublin has switched to Google's e-mail - with other universities considering such a switch. Google is also offering students online tools to use in their coursework. With its search engine already integrated into many internet browsers, Google is reaching out to integrate its services into university life. 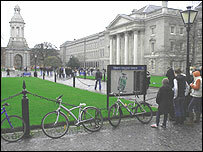 In Trinity College Dublin, the existing university e-mail network, providing addresses for staff and students, is being replaced by a Google system. The addresses and domain name still remain the same - but underneath the bonnet, it's a service provided by Google. 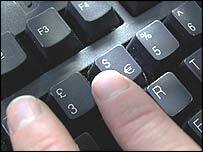 These e-mail addresses, which can be accessed from any online computer, can be kept by students when they leave universities. And universities, with a population of tomorrow's young professionals, represent a highly attractive market for such technology companies. Apart from targeting advertising at affluent former students, there will also be valuable data from the e-mail traffic. In the United States, Arizona State University, with 65,000 students, has also moved to this "Google Apps for Education". 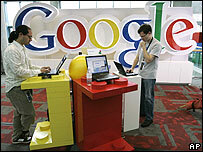 Linköpings university, with 26,000 students, in Sweden is also switching to Google. A number of other universities in the United States and Europe are believed to be considering moving to such a customised service, built on the Google platform. In Africa, Google says universities in Egypt, Rwanda and Kenya are using its education package, which a company spokesperson says shows the "democratising nature of the online world in terms of access to information". The offer to higher education also includes free online tools, hosted by Google, which allow students to work on files from any internet-connected computer, on campus, at home or anywhere else. They allow for collaborative work - with students able to work together in real-time on the same document. Online timetables and calendars, which can be accessed from university or at home, are also being promoted for use in university. Michael Nowlan, director of information systems services at Trinity College Dublin, says there have been debates within the university about privacy and loss of control to Google. But on balance, he said that this "groundbreaking" partnership was to the university's advantage - outsourcing the need to maintain an e-mail system, without any cost. Mr Nowlan says that Google is making a serious effort to enter the international higher education sector. And he predicts that the idea of shared online documents, which can be edited from any online computer, will be adapted by students to their own purposes. "The digital natives will find their own way, make their own discoveries." But there have been concerns about warnings about the way that internet companies use personal data - with Google singled out for criticism as being "hostile" to privacy in a survey published on Monday by Privacy International.